The Most Interesting Man in the World is a man of few words—except when he's recording his outgoing voicemail message. Then, he (or possibly a parrot who sounds just like him) sets up elaborate automated prompts to direct his friends and fans to the most interesting information he can provide. 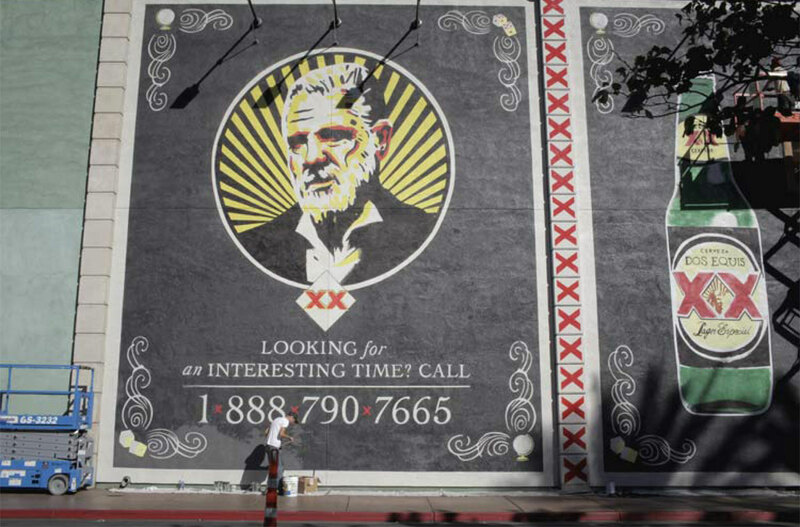 Dos Equis has put up a mural of the Most Interesting Man on the side of Diablo's Cantina in Las Vegas. "Looking for an interesting time?" it asks. "Call 1-888-790-7665." Doing so leads the caller to the Man's voicemail, where different prompts lead to various jokes about bachelorette parties, out-of-control blimps, blackjack-playing otters and low-fat blueberry muffins. Below, check out the full voicemail transcript from the writers at Havas Worldwide (formerly Euro RSCG) in New York. AGE GATE: Hello. You have reached the Most Interesting Man in the World. My answering machine is currently locked, and requires a password to access. Lucky for you, the password happens to be your age. Enter it now, then press pound. IF OVER 21: Well, it seems everything is in order here. Again, you've reached the Most Interesting Man in the World. But I am not here right now. I am not even recording this message. The voice you are hearing belongs to a parrot who has learned to mimic my every vocal nuance and has taken the initiative to set up my voicemail. —If you wish to reach Diablo's Cantina, press 0. —If you want to speak to me directly, press 1. —If you are calling for advice, please press 2. If you need advice about a woman, please press 1. If you are calling from an out-of-control blimp and need emergency landing advice, please press 2. If you can't find your wallet, press 3. —If you are calling about a bachelorette party, please press 3. I do not perform at bachelorette parties. If you wish me to reconsider, press 1. —If you are calling about renting the otter that I have trained to play blackjack, press 4. —For my easy, low-fat blueberry muffin recipe, please press 5. —To hear some on-hold music, please press 7. —If you are one of the several people who left their bathing suits at my home during my recent Lunar New Year barbecue, please press 8. —If you are a woman who has not heard from me in a while, press 9.